Guess present a classic men's style statement with this gold plated timepiece. A timeless black dial is presented within a polished yellow gold tone case, with co-ordinating hour markers and hands, and trio of sub-dials. A yellow gold plated bracelet completes this luxurious look, versatile for all occasions. 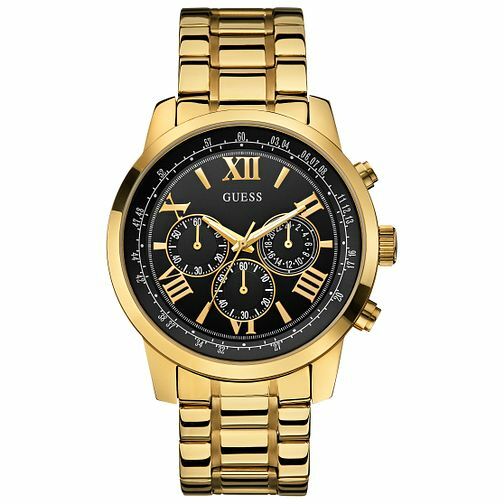 Guess Men's Yellow Gold Plated Bracelet Watch is rated 4.5 out of 5 by 2. Rated 5 out of 5 by Anonymous from Very stylish. I bought this as a birthday present for my partner and he absolutely loves it! Couldn’t of been happier or more grateful when he opened it. Would 100% recommend. Rated 4 out of 5 by Anonymous from Great gift Bought this watch for my brother as another addition to his watch collection. It's very stylish and the gold is a nice color that makes it look rather premium. Very happy with it and so was he when he got it for his birthday.